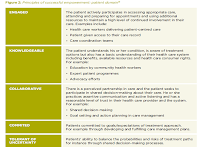 Patient empowerment can be thought of as patients being an active and self determining part of their healthcare, rather than passive recipients of services. The key question is: how to health systems efficiently embed this much admired concept into real everyday practice? A new report from the George Institute for Global Health “Realising the potential of patient empowerment for tackling chronic disease” (LINK) argues that there needs to be a major shift in thinking around patient empowerment from a nice to have to a fundamental part of reform for chronic disease where its impact and value add are evident. 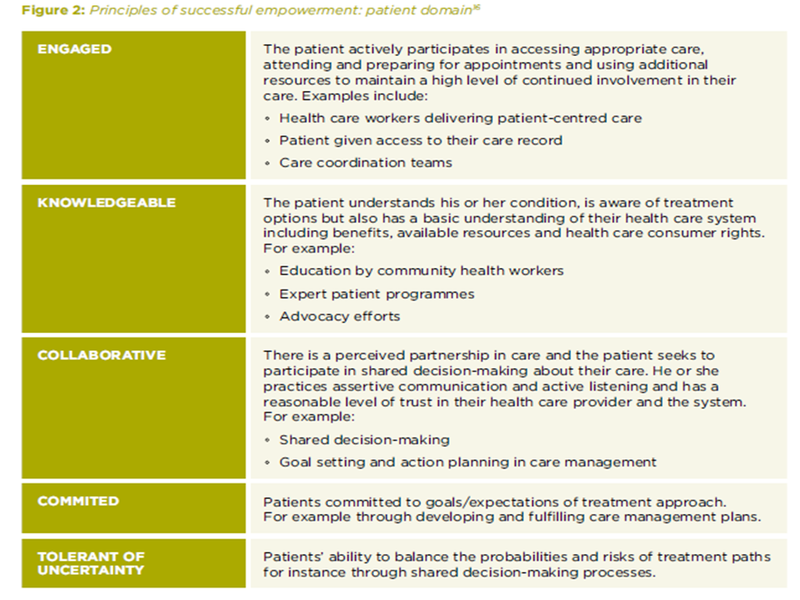 The principles of empowerment are a core part of the chronic care model where the interaction between an “informed, activated patient” and a “prepared, pro-active practice team” is widely accepted as en effective strategy to address long term conditions. The George Institute team emphasise that patient empowerment has lagged behind development of the wider system parts of the model in all health economies. They argue that is because we don’t yet measure patient empowerment or activation and what cannot be measured cannot be changed, or even managed. 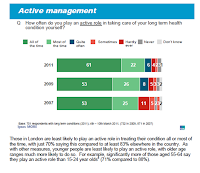 A quick look at the IPSOS MORI long term health conditions 2011 report, which is the fourth in a series looking at attitudes to self care since 2005 might be thought to fully support the contention that patient involvement in care is lagging behind other aspects of system reform. Awareness and usage of training courses which may help individuals to learn the skills that would help them care for their condition remain low. Two thirds of adults with a long-term condition say they not heard of such courses with just one in 20 having used one. In contrast, two thirds of people have discussed managing their health and care needs with a doctor or nurse in the past 12 months and almost all feel that these discussions were helpful and empowering. Furthermore, almost all of these people feel that the discussion has improved how they manage their own health. Things are improving. 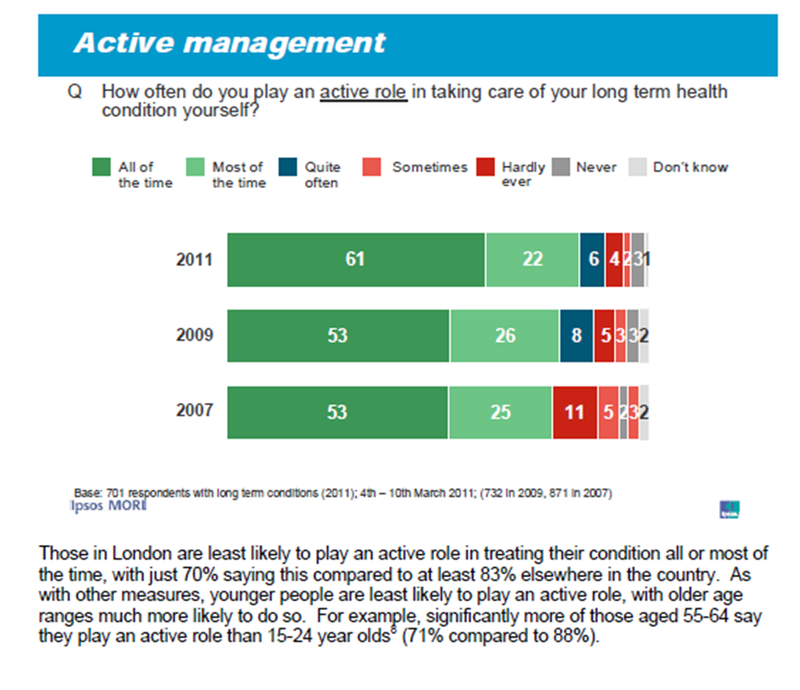 People with long term conditions are now more likely to feel that they get some or all of the support they require. More of those who have been in hospital within the last 6 months received a care plan than in previous years and are now also more likely to receive instructions for taking medicines. More people now feel that they receive support to help them understand the information provided to them. Nearly three quarters of these people feel that they received some or all of the support they required, an increase over 2009. Around four in five say they play an active role in treating their condition, in line with previous waves of the IPSOS MORI study. As before, people typically mention more information about their health condition and treatment as potentially helping them take a greater role in the care of their condition. Understanding, operationally what is empowering and who is empowered is complex but essential to achieving scale in empowering strategies. At the same time, such understanding is critical to achieving enough specification to allow impact and values to be measured. Kidney care is well placed to adopt these strategies. Patient involvement is critical across the whole of the kidney care pathway but perhaps nowhere moreso than in advanced chronic kidney disease where successful engagement of patients and practitioners in the choice and preparation agenda for renal replacement therapy or conservative kidney care will, for many, determine the future patient experience and clinical outcomes. Our NHS Kidney Care programme supporting timely listing for transplantation, care planning and the conservative kidney care workstreams provide an opportunity to put patient empowerment at the centre of kidney care mutliprofessional teams working. The proposed augmented tariff for multiprofessional outpatient visits should provide resources to keep patients at the centre of careplanning. Methodologies such as those used in quantifying patient activation and those suggested by the George Institute can be used to evaluate the scale of patient involvement and study its impact.